What a difference a week makes in terms of the weather and what a great test of character for the young rugby player and of course their parents. Again a big welcome to our new players Jimmy and Chris. After only one or two training sessions they were thrown in at the deep end (an apt metaphor given the weather) and both gave great account of themselves. With us adopting the new 'Shaping the Game' rules at the start of the season, we were required to have a minimum of 9 players which we managed to achieve. We also borrowed two players from Claverdon which allowed interchanges. This year, we are able to play either a game of 2 x 20 minute halves or a derivative of this. For this game we decided to play 2 games of 2 x 10 minute halves. If a coach can be a happy with a loss then our results over the two games were extremely encouraging. When put into the context that Claverdon had played in two festivals in as many weeks and therfore at least four games, it was a mighty effort. I would also say that a number of their players appeared to have spent some time standing in what the local farmer's herd had deposited on the adjoining pitch. There were some big U11's!!! For the first 10 minutes, the boys were obviously thinking more about the homework due in on Monday than their rugby. Claverdon put 3 tries on us in the first 10 minutes and it wasn't looking encouraging as we were a bit 'rabbit in the headlights'. The half-time break appeared to give the boys the time to collect their thoughts and switch on. This was evident in the second half where we defended better, our rucking and mauling improved and some good running resulting in a split 1-1 half. As we are counting points rather than tries this season, a 20 points to 5 loss. The second game saw further improvement with the boys gaining more confidence as the game progressed. Claverdon had a squad of 14 players available on the day and despite this we appeared to be more dominant in the rucks and mauls with periods of solid defending as well as some good attacking runs. A 10-10 half-time score line was indicative of us finishing stronger than our opposition but unfortunately two defensive lapses towards the end of the second half produced 2 late tries to Claverdon. The final 20-10 scoreline was not really indicative of the way the boys played and that we finished stronger as the game progressed was what was most pleasing. The whole team contributed and there were many positives to take forward to training next week. There are also a number of thing that we will need to work on as well. There were some great individual defensive hits with Ollie Lonie, on more than one occassion targetting their biggest player with crunching ball and all tackles. Ethan and Ollie Dickson again took the ball forward with some evasive runs and Josh Talliss, obviously benefitting from those off-season ballet lessons, pivoting 180ͦͦ° a la American football style, leaving a number of defenders standing still. Toby and Josh Hull also made some good runs and Josh showed his capability with the boot with some good re-starts and free kicks, both of which are skills that can take some time to master. Again young Jake Lowe continued to showed great ability in the mauls, ripping the ball off much bigger opponents. I was standing next to one of the coaches on the side line when he commented on Jake's strength when he took on their biggest player in a wrestle for the ball (and won). Our rucking and mauling improved as the games progressed and the Claverdon coach also commented on how successful we were in turning over their ball and how well we mauled against a much bigger team. Congratulations must also go to our two first timers Jimmy and Chris. As mentioned above, neither have had extensive rugby experience and going from structured training to the apparent randomness of a game is a big step. It's a good test of a players ability to quickly process everything going on around them. Despite some initial hesitation and the odd forward pass both Chris and Jimmy contributed to the game as much as the rest of the boys. I spoke to the Claverdon coach after the game and informed him that we had two first time players and he noted that he wouldn't have known it from watching the team play. Quite a compliment. There are of course a number of areas where we let ourselves down and if done better on the day I think we would have probably won. Despite some good attacking runs we didn't capitalise by passing before going into contact (as did Claverdon in a good passing move leading to a try), we missed too many tackles, and we spent too much time going backwards before going forward. We have areturn fixture with Claverdon and it will be good to show what Old Y's can do. We have training next week at the club, and this will be a great opportunity to build on the momentum from the game. Hopefully the weather will be slightly kinder and we will have as many of you as able to attend. Well done lads and see you next week. 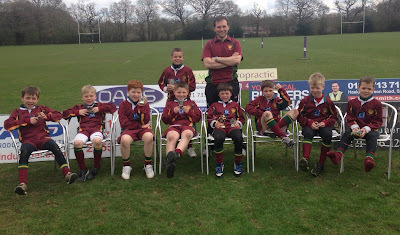 A fantastic start to the season by the U7s, despite the atrocious weather. We played a well organized Claverdon team who had several more players to call upon than we did, nevertheless we got off to a winning start. During the first game we saw some great running rugby from Wills who scored 3 great tries, easily outpacing the opposition. There was also some excellent support work from both Charlotte and Amy who managed to stay close to the ball carrier to receive try scoring passes. Fantastic work! During the second and third matches Claverdon were able to rotate fresh legs onto the pitch so we struggled to win the next two matches, drawing one and losing the other despite some great defensive tagging from both Matthew and Jake. However, the team rallied well for the last match and after some inspired substitutions from the U7’s coaches, the introduction of fresh legs in the form of Bayley and Sophie provided an injection of pace that stunned Claverdon and secured us a well deserved victory. Great work! We were really pleased with the team’s enthusiasm and their keenness to play, & especially pleased with how Charlotte and Matthew quickly settled into their first completive matches. We are really proud of them all. We are now looking forward to our next match, and in particular having Flynn back in the team, which will really add an even greater cutting edge to our attack. Your coaches Rob and Pete. I realised when I had the date put on the web that with the holidays just starting that the meeting would be poorly attended, but I forgot what a globe trotting bunch you are. Nevertheless Dave Adams and myself carried on with the meeting as a couple of important decisions had to be made. As the first Sunday in September is the 1st when many will still be lying on the beach, it was decided that registration would take place on the 8th and 15th September.We all know how important these dates are to the Junior Section and we must get it right. Over the next 2 weeks we will promote the club in the local newspapers inviting any of the the local community who want to get involved in Rugby to attend the 2 open days which will coincide with our registration dates.We will concentrate on boys and girls aged 7 to 12 and hope we get a good response. We will decide which teams we can run when we know the outcome of registration. We all know we need 2 or 3 players in each age group to become a real rugby force and hopefully everyone will work towards this aim. We decided last year that we will attempt to put a complete calender of fixtures together during September so that we avoid some of the problems of last year. The great news is that Dave is prepared to continue as fixture sec and we will need to look at areas such as. PROPOSED TOUR DATE AND PRESENTATION DAY. POOR WEATHER WHICH HAD SUCH AN EFFECT LAST YEAR. We are confident that all will be well for the start of next year. It is so important that we take every advantage of the coaching courses available to us. I have just received details of a LEVEL 1 Course to be held at Stourbridge on August 11th. Please contact me if we have any takers. The LEGACY OF THE WORLD CUP will be so important to the club and I hope we can take full advantage of what is going to be a wonderful occasion. Because of comitments in France etc I will not be available to the extent that was possible for the last 2 years. I AM NOT DISAPPPEARING BUT WE DO NEED MORE PEOPLE TO GET INVOLVED,WITH A STRONGER COMMITTEE TO ENSURE WE ACHIEVE OUR MAXIMUM POTENTIAL. capacity, please contact me on my new web address. dynamodavies@outlook.com. come along, I might even buy the first round. I propose Friday 26th July at 7.00pm. Hoping everyone is enjoying the sun! 1) Improvements to the club house and grounds are continuing at a pace. Next weekend Nat West are visiting the club to see how we are spending £4000 grant they have given us via the RFU. It would be great to have as many volunteers as possible at the ground either on the Saturday or the Sunday from 10am onwards. If you can use a paint brush hammer or spade your help would be much welcomed. 2) On Friday BMW came to the club to present the trophy they have sponsored for our young player of the year. That honour went to Tyrell Peters the under 17 winger. This was followed by a curry night quizzes and lots of drinking which all seemed to enjoy. 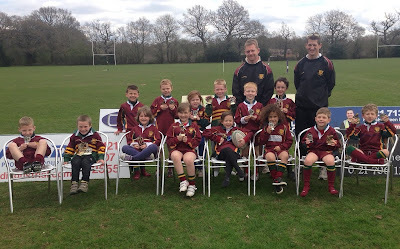 3) The RFU have donated one free place to any coach who wants to take the old level two coaching course, which involves two Sundays and homework. Anyone interested please contact me ASAP. Unfortunately the weather didn't quite deliver what was promised but I think the rugby more than made up for it. 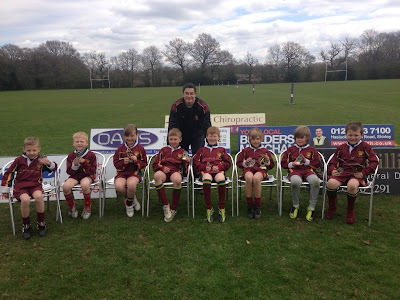 The U10's travelled to Redditch for their Festival (along with the U7's and U8's), for what turned out to be an entertaining and enthralling series of encounters against Redditch, Kings Norton, Woodrush and Old Eds. It was good to see almost a full team out following weeks of bad weather and school holidays. Seems a lot of excess energy needed to be expended. Dan Hayes, Oliver Dickson, Josh Hull, Ethan Hart, Oliver Lonie, Jake Lowe, Josh Tallis and the welcome return of Toby Good. Toby came off second best after a session of extreme BMXing. Special thanks must also go to our honary Old Yardleians who helped make up the magic 9. These were Jacob and Liam from Old Eds (how they manage to get a squad of 15, I'll never know), Louis +1 from Kings Norton and Squirt from Redditch. With 5 teams playing we ended up with four games of 8 minutes per half, although at times it seamed that not a lot of attention was being paid to the clock. Our first game was against Woodrush. We have enjoyed a number of close games against them but have managed to come out on top in our recent games. It was a good start to our Festival with an 8 tries to 2 win for Old Yards. Not having played together as a team for some time, it was a good game to start the day. Our scrum was dominant with Ollie Lonie, Dan and Ethan combining well to win most of the oppositions put in as well as our own. We tackled well and obviously ran well with most of the team participating in the scoring. Our second game against Kings Norton was always going to be a very different matter. They are a very physical team and you could see the impact of that in our team at half time and at the end of the game. The boys had to do a lot of tackling and put a lot of work into the rucks and mauls which were noticiably more intense. The boys took it in their stride and went about their work and only just went down by 3 tries to 1 in what was a tense battle between two good teams. Redditch were our next opponents and the return of the largest 10 year old we have ever seen. He was certainly a test for our tackling and it took a few collisions leaving the tackler sprawled out on the ground before the boys started to go for the legs. Well done to Ethan for pulling off a number of great front on tackles on him which showed the way for the rest of the team. The boys also combined well to save a certain try after a prolonged Redditch attack on the Old Y's try line. Great deterrmination. Lots of good mauling and again young Jake proved that strength and technique will almost always win over size. He even came close to winning in a one on one contest for the ball with the giant Redditch player. Josh Hull put his body on the line a number of times and at the end of the day learnt a very important lesson in not leading with your head. Both Josh's made some great runs in all games and were rewarded with tries. Redditch were leading 2 tries to 1 going into the last 2 minutes and it looked as if we were going to score after a number of attacking phases close to their line. Unfortunately a turnover in the very last play of the game saw a breakaway try against the run of play resulting in a 3 tries to 1 win for Redditch. The boys were naturally very dissapointed after this game as they had stuck with it right to the end and had the belief that they would score and tie the game. A fantastic effort on our part and it was great to see the determination right to the end. The final game saw us take on our local rivals Old Eds. The last time we played them we scored 15 tries. Thanks to Liam from Ed's who backed up for his second game and he seemed to really enjoy his time playing in the scrum against his own team. The game proved considerably tighter than the last time we met and we did put together some good passages on play passing well in attack and tackling with enthusiasm. Toby played one of his best games and used his strength in running with the ball but more importantly in his contribution in the mauls. Again our scrums were very dominat with Ollie Lonie, Ethan and honarary Old Y, Liam timing their push just right with the put in to win most of the scrums. A good end to the day with a 4 tries to 0 win. Unfortunately we needed Redditch to beat Kings Norton in order for Old Y's to play in the final. This didn't happen so that was the end of the road for boys for the day. Redditch played Kings Norton in the final which I was asked to referee and predictably, a strong Kings Norton team ran out winners by 4 tries to 1. 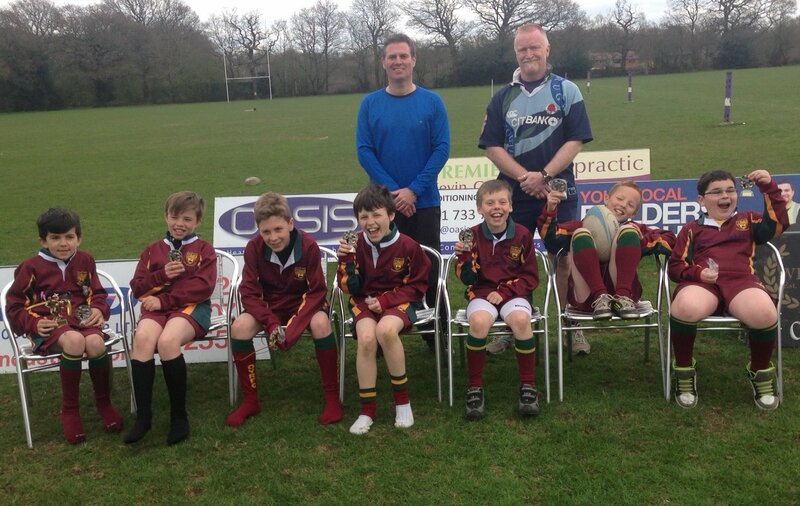 All in all a great day of rugby played by the whole team with everyone contributing. Ollie Dickson scored some great running tries and threw himself into tackles and even managed to get straight back up after an attempted tackle which didn't quite work the way he had intended. Dan also did well again with a good alround performance showing great intelligence with the highlight being a well timed final pass resulting in an Old Y's try. A very pleasing day from my perspective and irrespective of the fact that we didn't make the final, a great series of performances against 4 different teams having different styles of play. We have previously beaten Redditch and we are more than capable of beating Kings Norton. I think it is more than apparent that the boys are starting to play for each other and are turning into a team rather than a group of individuals. Thanks to the boys for their efforts and of course the very loyal band of parents supporting the team. Training this week (unless things change before Sunday) so let consolidate on a strong performance.